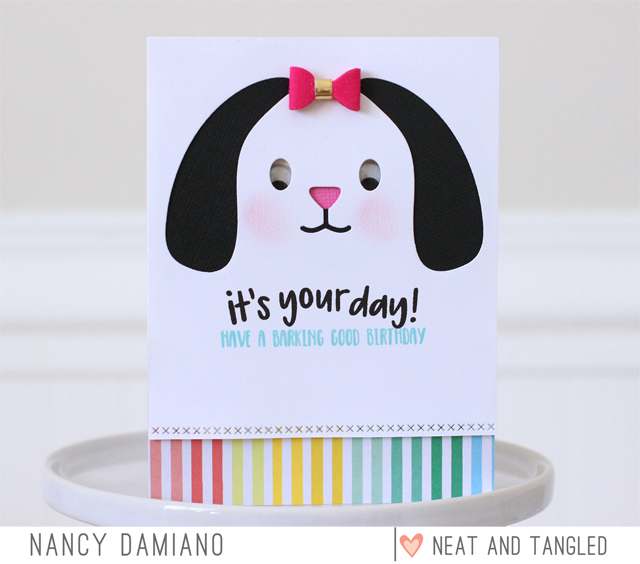 Love your girly adorable doggie card! SO CUTE. I love how you added "side eyes", as our daughter calls it. Way too adorable. I like that paper at the bottom and the bow was a perfect touch. How cute with the rainbow stripes and the felt bow. Love your little girl dog and your striped paper. Such a cutie! I love the pink bow! Such a wonderful and sweet project! Absolutely adorable! Love this sweet pup and the pretty pink bow! This is so cute! Love the bow! Awww!!! Your little girl dog is absolutely adorable! Love that pink bow!!! Awww . . . she's so sweet! Love the strip of paper along the bottom and the googly eyes add a fun touch. Too cute! I love the bow! That dog is just irresistibly cute !